Use this theme's early science, role play, and manipulation ideas to keep your little magicians occupied. Since children learn while having fun, make circle time extra special by changing children's regular spots and decorating with lots of shiny or transparent items to add a touch of magic! Hang stars, tulle, shiny curtains, tiny white Christmas lights, etc. Surprise children with glow-in-the-dark stars. Simply stick them on items. Turn off the lights and feel the magic in the air. 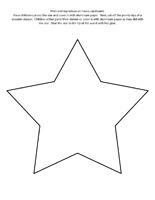 Over your circle time area, hang stars to identify each child's spot. The pictures may be used as a memory game or to spark a conversation with your group. Use them to decorate your daycare or a specific thematic corner. (Open picture game-Magic) Print, laminate, and store in a Ziploc bag or in your thematic bins. 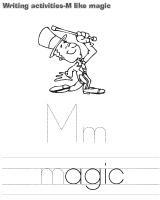 (Open writing activities-M like magic) Print for each child or laminate for use with a dry-erase marker. 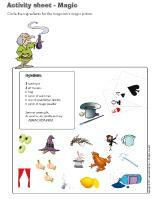 (Open activity sheets-Magic) Activity sheets are suggested for each theme. Print and follow instructions. Blocks of all kinds on which you can glue sparkly stickers or stars. You may also wrap them with metallic wrapping paper. Blocks with gears "magically" make creations work in various ways! A container filled with plastic birds to represent the doves which are often used by magicians. Small plastic hoops or circles, string, beads, and feathers which can be used to make dreamcatchers. Lots of glitter for sparkly creations. Gel crayons and dark paper, letters will magically appear! Empty toilet paper rolls, scrap paper, and lots of imagination for making magic wands. Scissors with a variety of different edges. Sparkly stickers for collective or individual collages. Stones which can be painted to become...magical stones. 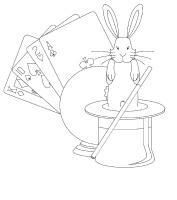 Coloring pages related to the theme: magicians, magician hats, rabbits, etc. Use glue to draw on paper and then sprinkle with glitter. Invite children to draw what they would like to see appear... just like magic! Draw with flashlights, in the dark, or with a black light. The magician's kitchen. Provide large pots, a variety of ingredients, large spoons, dishes, wine glasses, magic powder (Jell-O), etc. The magician. Provide a magician's cape, a magician's hat, a magic wand, a stuffed rabbit, a bird cage, a deck of cards, etc. A memory game related to the theme using educatall.com's picture game or a store-bought version. Dark blue or black modeling dough. Add sparkles! Various card games. Children love manipulating oversized cards. Various joke and trick items. Add tiny lights and tulle to your reading corner to create a magical mood! Book and CD sets children can listen to with headphones. Sequential stories children can place in the correct order. Explore the letter M like magic. An obstacle course children can complete in the dark. Add objects children must search for throughout the obstacle course such as a magic wand, a rabbit, a bird, a playing card, etc. Organize a treasure hunt. Children search for the ingredients for the magician's magic potion. Parachute game. Children disappear under the parachute. Activities in the dark with flashlights or light sticks. 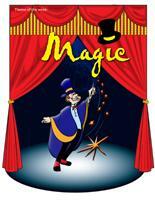 Practice simple magic tricks or juggling. Play with children's shadows or objects behind a white bed sheet. Container filled with colourful marbles. A small container filled with glitter or stones covered with fluorescent or sparkly paint. Use lemon juice to write secret messages and make them appear with the heat of a candle. 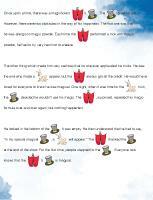 (Open picture clue story-Magic) Print. Sit in a circle with your group. Begin reading the story. When you get to a picture, point to it and invite children to guess the missing word. One child holds a magic wand and gives the other children instructions. The magician points and says, "I transform you into..." (frogs, tables, horses, etc.) The other children must pretend to be transformed and act out the various instructions. After a few transformations, give another child the chance to play the role of the magician. Touch a child's sweater, pants, socks, etc. with your magic wand. The child must name the item of clothing you touched. You can make the game more difficult by asking children to name the color of the clothing item too. Variation: You may choose to work on body parts or another theme if you wish. Deposit a variety of items on the table (star, wand, etc.) Children observe the items closely for one minute. Cover the objects with a blanket and remove one object. Remove the blanket and invite children to identify the item which disappeared. 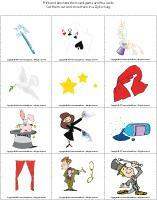 (Open picture game-Magic) Print, laminate, and glue the pictures on the floor to create a path. Children must jump from one picture to the next. At the end of the path, deposit a stack of playing cards. When children reach the end of the path, they must successfully make two playing cards stand together (like in a card castle) before hopping back along the path. Hang a large white bed sheet and make Chinese shadows with your group. Children can try to make simple animals like a frog and hop behind the bed sheet. Create animals with your hands or glue shapes to the end of wooden sticks. Simply provide playing cards for your group. Sit on the floor and have fun playing with the cards in many different ways. Deposit one hula hoop per child on the floor. The doves (children) fly around the hoops to the sound of music. When the music stops, each dove must fly into a hula hoop. The dove which does not have a hula hoop is eliminated. Remove one hula hoop after each round. Press the joints of your index and middle finger in flour. Make prints throughout the daycare, creating a long path. At the end of the path, children find a magician's hat with a stuffed rabbit inside. Stand in a circle. Children hold hands, except for one child who is the rabbit. This child stands outside of the circle, holding a magician's hat. The rabbit hops around the circle and deposits the magician's hat behind another child. He then runs around the circle. 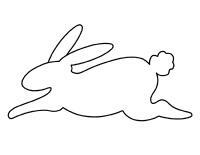 The other child runs behind the rabbit, trying to catch him before the rabbit sits in his spot. The game continues. Where are the rabbits hiding? (Open tiny bunny) Print and laminate. Deposit tiny cardboard rabbits throughout the daycare, placing them so that only their ears are visible. When you give the signal, children search for the rabbits. At the end of the game, you may let each child keep one rabbit. 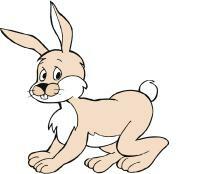 (Open game-The rabbit's tail) Print and glue the rabbit to the wall, at children's level. Glue a cotton ball to each rabbit tail. Blindfolded, children try to stick the rabbit's tail as close to the correct spot as possible. Deposit a large container filled with flour on the ground. Add tiny stars or confetti. Children must search for the items in the magic powder. Children practice a magic trick at home with their parents and present it to the group during a special magic show or during circle time. Organize a magic corner by hanging a curtain from the ceiling and adding a mirror, a chest, hats, scarves, playing cards, hula hoops, etc. Use cardboard boxes and Christmas lights to create a stage. Play music. 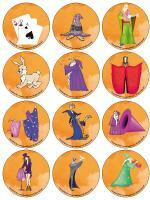 (Open magnifying glass game-Magic) Print and laminate the board game and the cards. Cut them out and store them in a Ziploc bag. Children pick a card and search for the item on the board game using a magnifying glass. Once they have found the item, they deposit it in the correct square on the board game. Deposit several different objects on a table (nails, paperclips, coins, elastics, aluminum foil, crayons, blocks, lipstick, etc.) Place a magnet near each object, one at a time. Deposit the items which are attracted to the magnet in one container and the items which are not attracted to the magnet in a separate container. Discuss the results with your group. 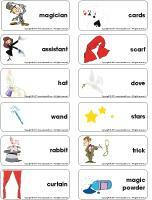 (Open story and memory game-Magic) Print, cut out, and laminate the illustrations. Place the cards face down on a table and invite children to pick three cards. They must invent a story using the three illustrations. Variation: Print two copies and use as a memory game. (Open hunt and seek-Magic) Print and laminate. Children pick cards and search for the items in the picture. (Open snakes and ladders-Magic) Print and laminate. Use a die and tiny figurines as playing pieces. How can we catch an ice cube in water using only a piece of string? Your daycare worker will give you a glass of water and a piece of string. Place them in front of you. When everyone is ready, your daycare worker will deposit an ice cube in your glass. Difficult isn't it? Now, your daycare worker will give you magic powder. Ask children, "What do you think happened? What do you think the magic powder was?" Let children think about it and state their ideas. When they are done, tell them it was just table salt. Salt has special properties. These properties make ice melt. This is why we put salt in our driveways and on roads in winter. Salt is very useful. It prevents many injuries related to slipping on ice and considerably reduces the number of car accidents. In your experiment you used only a pinch of salt. It was not enough to melt the entire ice cube. However, it was sufficient to melt a tiny portion of it which was enough for the string to penetrate the ice. The temperature of the water cooled the portion of the ice cube which had melted upon contact with the salt. The ice cube hardened once again, trapping the string inside. (Open model-Magic wand) Print and copy the model on heavy cardboard. Have children cut out the star and wrap it in aluminum foil. Cut the ends off wooden skewers and let children paint them or wrap them in aluminum foil. Glue the star onto the end of each child's wand using hot glue. Roll a piece of construction paper to make a cone. Use adhesive tape or staples to secure. If you choose to staple the hat, use adhesive putty to hide the staples. Cut stars out of aluminum foil and glue them on the hat. If you prefer, children can simply draw stars on their hat using gel pens. Slide ribbon through the tip of the hat. (Open craft-Dove) Print and cut out. 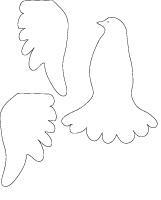 Have children glue feathers to the end of the dove's tail. When they are done, they can glue the wings on either side of the dove. Add ribbon and hang. Variation: Print several copies and make a mobile. 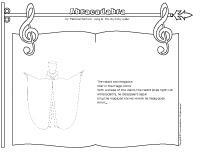 (Open creative coloring-Magic) Print for each child. Invite children to complete the picture. What will appear? 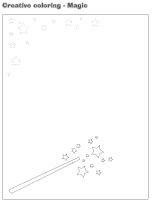 (Open coloring pages theme-Magic) Print for each child.